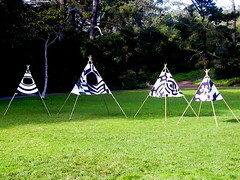 My sister and brother-in-law had an exhibit in Golden Gate Park in San Francisco. They hung out and asked random passers-by to join a tug-of-war. Much wholesome fun was had by all. More on dazzle ships here.